For February 2007, the average listed rent price of all listed rentals in these areas was $1,435.84, representing a 5.3% increase over two months ago. This was a general price increase across all rental types, with about 30% of listings in the San Fernando Valley -- Central region being houses, duplexes, or triplexes, as opposed to apartments, condos, or townhouses. This ratio of houses to apartments was relatively unchanged over two months ago, when approximately 27% of listings in these areas were listed as houses, etc. There was a shift toward more multi-bedroom houses and apartments listed for rent. Two months ago, approximately 58% of listings in the San Fernando Valley -- Central region had two or more bedrooms. For February 2007, that percentage has increased to approximately 60%. The largest rent increases occurred in Arleta, where the total increase was 25.4% and Sun Valley, where the total increase was 19.5%. Rent prices also increased in North Hills (up 14.8%), Sylmar (up 13.0%), Granada Hills (up 1.5%), Panorama City (up 1.0%), and Van Nuys (up 0.8%). 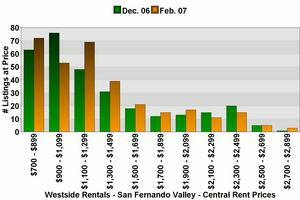 Rent prices decreased in Mission Hills by 16.8%.